What is there to do in Pagosa Springs, Colorado? Check calendar for dates our outdoor pool will be closed for cleaning! Wow! Pagosa Springs is off and running into a summer jam-packed-full of fun events for both locals and visitors. 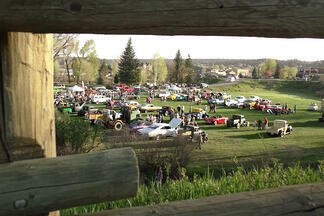 Last weekend kicked off the summer with the 5th Annual Pagosa Springs Car & Motorcycle Show. What a great show it was! I don’t know the official numbers, but it looked like there were more cars than any of the previous years. The cars ranged from older cars that were just starting to be refurbished to decked out newer vehicles. There were also food vendors, live music, a beer & wine garden, and the Colorado State Patrol did a roll over simulation. The weather was in full cooperation and helped to make the day a gorgeous one! If you are looking to come to Pagosa when it’s not at its busiest, but there is something going on, I suggest planning on coming for the car show! Memorial Day Weekend is a busy weekend with golf tournaments, camping, rafting the river, and much more. The big music events of the summer begin with the Folk n Bluegrass Festival June 7, 8, & 9, and it ends with the Folk Festival August 30, 31 and September 1. Check out the Folk West website for more info www.folkwest.com. Chimney Rock, which is a new National Monument, features tours and wonderful full moon tours during the summer. Find out more at www.chimneyrockco.org. The Pagosa Springs Center of the Arts is producing “Monty Python’s Spamalot,” “The Full Monty,” and “Good People” this summer. Check out their website for more info www.pagosacenter.org. Searching for something to do on a Thursday night? Check out the Thursday Night Rodeo Series held at the Western Heritage Arena on highway 84. The 5th Annual Pagosa Renaissance and Pirates Festival is held in the town park the weekend of July 19. The Archuleta County Fair is July 31-August 4. Come enjoy all kinds of exhibitors, the kids’ animals, food vendors, dancing, music, and more. GECKO also hosts a variety of running and biking events throughout the summer. Check out their website for more info www.joingecko.org. A sporting event in the morning and hot green chili in the afternoon! The Mountain Chili Cha-Cha combined with the Patty Aragon Green Chili Cook-off is August 24. As we slide from summer into fall, we close out our big season with the Colorfest Weekend. It is a weekend filled with the hot air balloon rally, Passport to Pagosa-Wine & Food Festival, and the Bands, Brews, Etc. This year it is slated for September 20-22. The Pagosa Springs Golf Club course also plays host to a number of different golf tournaments throughout the summer. If you know Pagosa during the summer, you may be thinking to yourself "She forgot the busiest, biggest, most wonderful time of the summer in Pagosa…the 4th of July!" No, I didn’t, I was just saving my favorite for last. 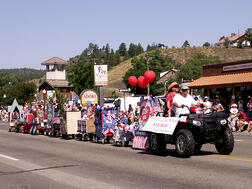 Pagosa Springs during the 4th of July is filled with small town excitement! There is the Park to Park Arts & Crafts festival, the carnival in town park, the Red Ryder Rodeo, the 4th of July Parade and to top it all off…the fireworks show! (weather/fire ban permitting, of course!) It is a time when many people from outside our town come to enjoy the small town atmosphere, and a time for those who grew up here and moved away to come back and visit family and friends. This is my absolute favorite time in Pagosa! That’s my run down of the summer. There are a lot more events going on that I just don’t have room to list! Check out www.visitpagosasprings.com for a detailed events calendar and to get more info about all the activities we offer in the area.